—BMSC, East London Grand Prix Circuit (2016/07/09): Graeme Van Breda #1, Pieter De Vos #17, Sven Grüne #66, Kyle Robinson #18. —Jaco Gous #43, Johan Le Roux #44. Red Square Kawasaki ZX10R Masters: follow me. CHAPTER SIX: / Listen to the voice sayin' follow me/ Listen to the voice sayin' follow me/ —Frankie Goes to Hollywood, Two Tribes. 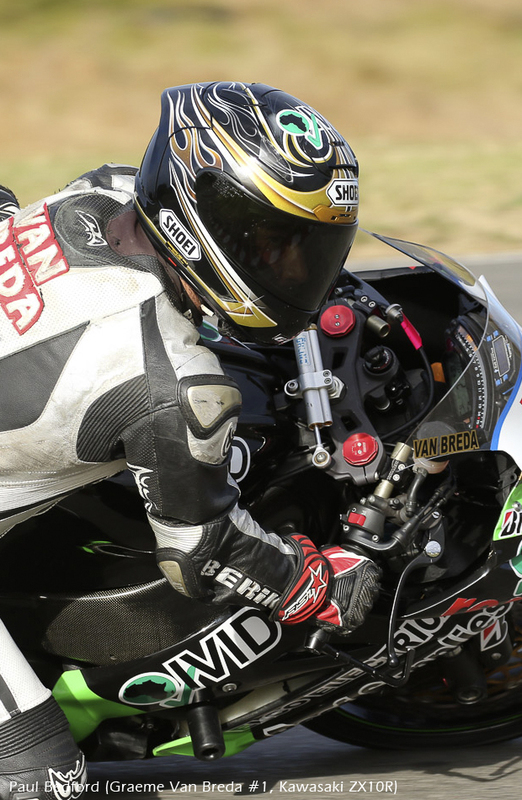 It felt like yesterday when the Red Square Kawasaki season kicked off at Red Star Raceway. The first race of the season is always the most exciting: new and vibrant livery, new superbikes, new members. The most enthralling one-make superbike series in the Extreme—motorsport—Festival bouquet. Currently the club stands on 33 members: Brian Bontekoning, Teddy Brooke #93, Stewie Christie, Peter Clark, Pieter De Vos #17, Sid Farinha, Appanna Ganapathy, Jaco Gous #43, Sven Grüne #66, Ian Harwood, Jason Joshua, Raymond Keel, Tony Klem, Johan Le Roux #44, Pierre Le Roux #56, Etienne Louw, Abrie Marais, Chris Marais, Rodney McLachlan, Mike McSkimming, Russ Page, Kyle Robinson #18, Stuart Russell, JB Schoeman, Henk Schuiling, Sanjiv Singh #12, Michael Smit, Wayne Spicer, Graeme Van Breda #1, Hano Van Der Merwe, Gerald Van Heerden, André Van Vollenstee, and Gavin Wagenaar. Now, you know them all. 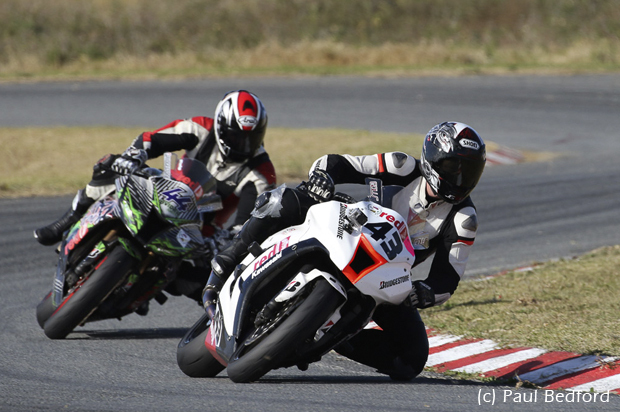 From captivating Red Star (Delmas), the Red Square Kawasaki ZX10R series moved to Zwartkops Raceway, for round two, then south to Phakisa Freeway, Aldo Scribante (PE), and BMSC. Border Motorsport Club (BMSC), East London Grand Prix Circuit, as it's also known, spring to life in 1930/1959. The circuit is 3.921 kilometres, and is flanked at one side by the ocean. I definitely need a holiday now. Halfway through the series, and the top five riders are rapidly moving away from the rest of the pack. With only four race dates left, contention for the Championship Crown, will get much harder. BMSC, churned out some pretty amazing results: Qualifying: Graeme Van Breda, took first place, with a best time of 1:23.349. Second to six: Sven Grüne, Pieter De Vos, Kyle Robinson, Jaco Gous and Johan Le Roux. Superpole (top 9) of course, is the true decider of where you gonna slot in on the stating grid: #1, with a best time of 1:23.121 (169.82km/h), #17, #18, #66, #44, #43, #12, #56, and in 9th, #93. From my vantage point, it seems that Grüne is the only rider that shows some degree of consistency. I will stick to my guns: Kyle is still my season favourite. So far he did not fare too well, mostly recording third and fourth places, but I will see this one through. On the flip side, seasoned rider Pieter “the Terrier” De Vos, did not fare too well either. I've expected much more from him; not one chequered flag so far. Let's stay optimistic. It ain't over till the fat lady sings ... BMSC H1 + H2 Results: Van Breda took both chequered flags. Grüne, recorded a DNF + 2. De Vos: 2 + 4; Le Roux (#44), 3 + 3; Robinson: 4 + 6; Gous: 5 + 5; Singh: 6 + 7. Jaco Gous was crowned Rider of the Day—CONGRATULATIONS! 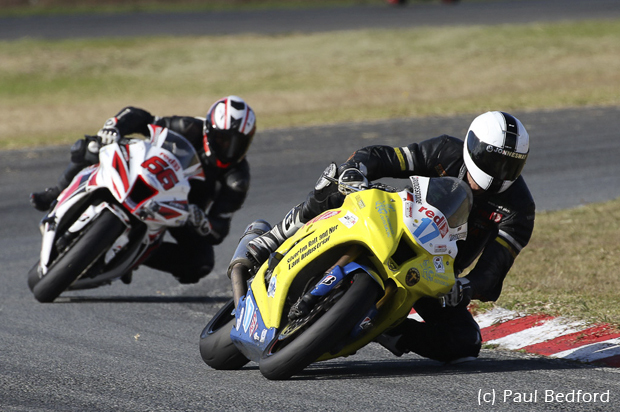 Spectators can definitely look forward to close contention, until the last chequered calls an end to the season, on 26 November, at Zwartkops Raceway. Yes, you can follow me on Facebook (rainmakerbell.com). 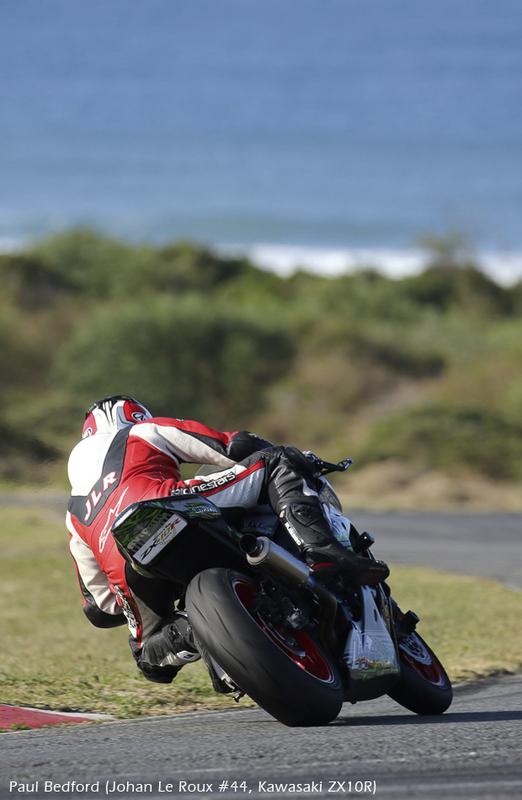 Come and experience the awe and wonder of the most successful national superbike outfit in whole of South Africa. After my first bloody nose, things only got better. The club always welcomes new members. If you would like to become one, are 35 and up, and have (absolutely) no fear in your heart, then this enthralling Red Square Kawasaki series, awaits your call. If you don't want to become a hardened member, then be a great follower. Come and show you true colours. Red Square (drinks) sport seven different ones (for the ill-informed): Black, Purple, Green, Red, Blue, Gold and Pink. What colour's your Red Square? They are also the main/title sponsor of the Kawasaki Masters Cup. But you already knew that. Then we have Bridgestone, to properly glue them to the ribbon of black; Kawasaki Motors South Africa (KMSA), keeping the lot on the start grid. Ah! 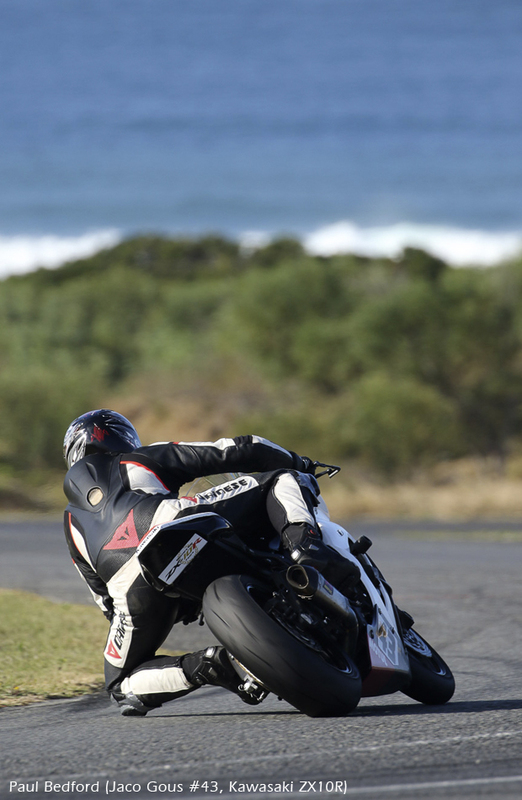 Before it slips my mind: the ZX10 Cup, celebrates its 10th anniversary this year—CHEERS! I click the PDF file Lynette just sent me, it's the latest (combined) points. This is what it all boils down to: points. I think it through for a moment: In life, on/off the racetrack, we are rewarded accordingly for our efforts. It's that simple. There are a few riders, that have not registered any points yet. They are still part of a great team though. I think it's called duality. Not all of us can be on top. Maybe, they deserve a few points for great camaraderie. As suspected, Sven is still the chief rooster of the cockpit, with a bold 159 points. Twenty-two-points shy of the leader is Kyle Robinson. In third place, "the Terrier" with 131. In fourth, Johan Le Roux, with 129. There is a 34 points difference between current national champion, Graeme Van Breda and Grüne, and only four shy of Le Roux. If the top four stays consistent, then Van Breda will truly find it hard to climb the ladder of ultimate fame. Gous resides in 7th place, Singh, in 8th. There is a marginal difference between Brooke (in 6th place), Gous and Singh. Gous and/or Singh might just end up in the fiery top six, before season's end. With their previous excursion (to Zwartkops), Van Breda, took a double chequered flag; Grüne recorded a 3 + 2. They both registered lap times of just over a minute. Zwartkops is a short, tight, fast circuit, that demands a lot of stamina. Remember: For an outstanding foretaste, practice days are open to the public, that will be the 8th of August, as mentioned. The Extreme—motorsport—Festival, runs a comprehensive racing programme for eight till late. 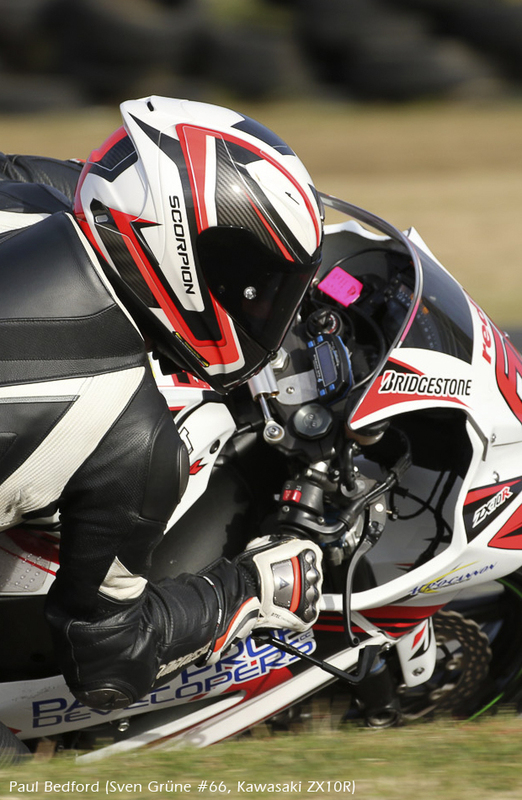 This will be your chance to meet pilots and riders up close, in a more relaxed motorsport environment. Come take a few selfies. Saturday, we will do it—officially—all over again. The masses will flock to track, and I will feel at home again. If you are in the vicinity of the Red Square garage, please come and say hi, you are most welcome. Mark Weitz might even offer you an ice-cold Red Square Reload. 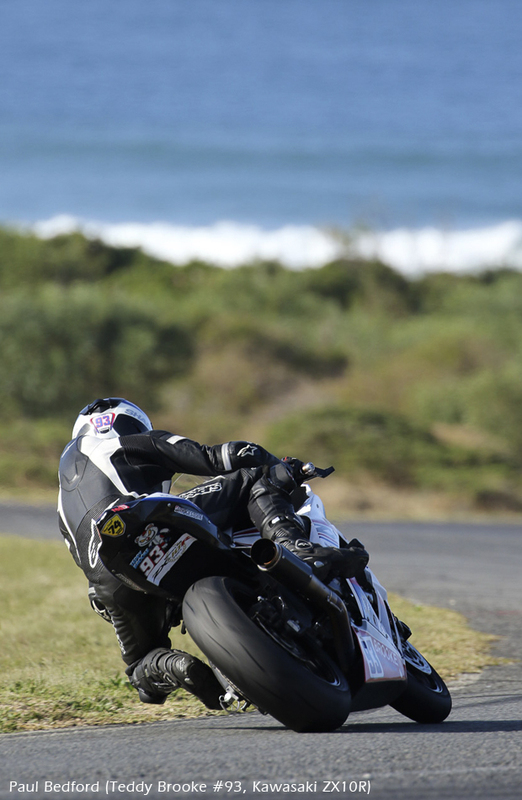 —Van Breda took both chequered flags. —Grüne recorded a DNF + 2. —Gous was crowned Rider of the Day—CONGRATULATIONS! —3 + 3 for the day. 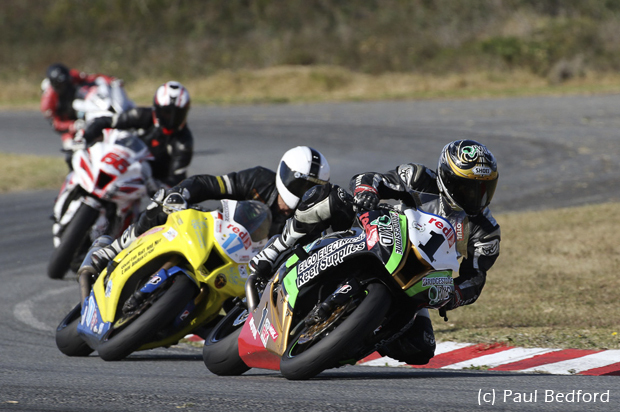 © 2016 www.rainmakerbell.com - Extreme Festival, Red Square Kawasaki ZX10R Masters, BMSC, East London Grand Prix Circuit, South African Motorsport, 2016/07/09. DOWNLOAD: Red Square Kawasaki ZX10R Masters PHOTO ALBUM (ZIP): 1 (7MB).